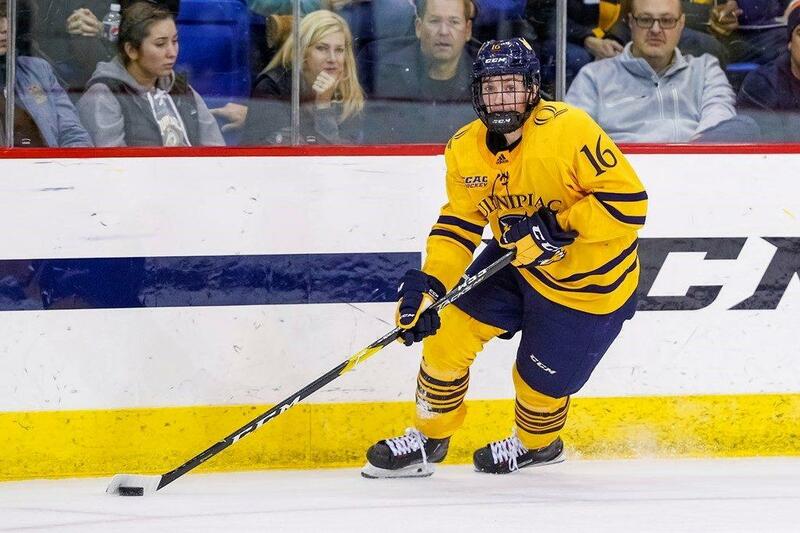 There was no shortage of offense for the Quinnipiac men’s ice hockey team (5-0, 0-0 ECAC Hockey) in the latter of their home and home series with American International College (2-4-1, 2-1-1 in Atlantic Hockey), winning by a score of 9-2. Unlike their 4-1 victory over the Yellow Jackets a game prior to this one, The Bobcats separated themselves from the get-go, burying four goals in the opening period. It was clear throughout the game’s entirety Quinnipiac was a superior skating team to AIC, but their increased effort and energy enabled them to widen the margin on the scoreboard. Freshman Wyatt Bongiovanni and sophomore Alex Whelan led the first period goal frenzy, both potting two goals in the first twenty minutes. The scoring pace was brought down just a bit in the second period, as the two teams went back and forth and exchanged goals to make the score 5-1 going into the final period. However, Quinnipiac stepped their foot on the gas once again, scoring four more to work their way to a convincing 9-2 victory. The term “point night” that players often use to describe blowout victories was put on full display for the Bobcats tonight. Eight players recorded multiple points, including a career-high five assists from senior defenseman Brandon Fortunato and Whelan’s first career hat trick. Fortunato has certainly been practicing what he preaches so far, considering the eight points (1 goal, 7 assists) he has tallied already matches his full season point totals from a year ago. As for Whelan, who was the team’s leading goal scorer in 2017-2018 with 16, the three goals he buried tonight were his first of the season. While he has been effective in other areas, getting the monkey off his back should propel his offense moving forward. Although this could be looked at as a statement win, the Bobcats will get right back to work at practice this week in preparation for conference play starting up next weekend at Harvard and Dartmouth. They will look to improve on this hot start that has Bobcat Nation buzzing once again.